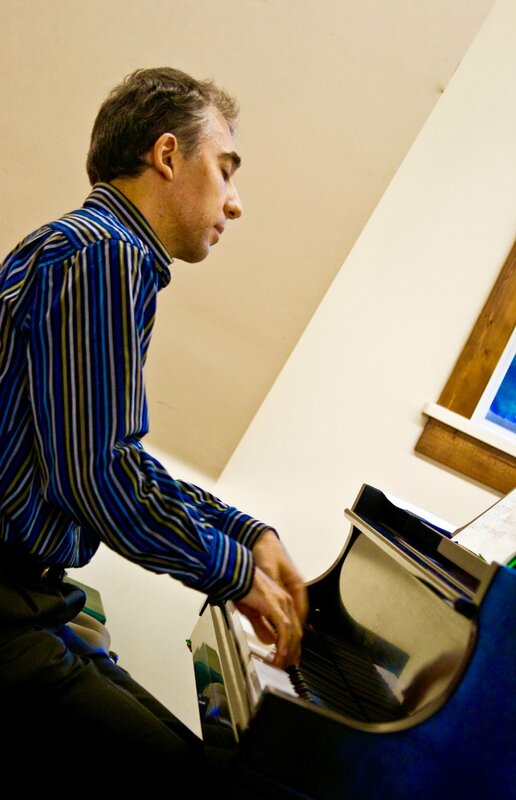 Born in Bulgaria, and a resident of Canada since 1995, Dimiter Terziev holds piano performance degrees from the National Academy of Music in Sofia (B.Mus), Concordia University in Montreal (Graduate Diploma), and the University of Alberta in Edmonton (M.Mus). He has studied under the tutelage of Dr. Stephane Lemelin, Dr. Anna Szpilberg, Prof. Milena Mollova, Prof. Antoaneta Arsova, and other distinguished pianists. Prize winner at the Chopin National Competition in Bulgaria in 1989, Dimiter Terziev has appeared in numerous piano and chamber recitals in Canada, USA, Bulgaria, Germany, and the Netherlands. He has also performed as soloist of several Bulgarian and Canadian Orchestras. The artist’s debut disc Colours of Bulgaria: Piano Pieces by Pantcho Vladigerov was awarded Four Stars both by the CBC's Sound Advice and La scena musicale magazine. He has later recorded three more CDs - Nocturnal World, The Beginning and End of Classicism, and Anger and Hope featuring music of various composers from the 18th, 19th and 20th centuries. The discs have been featured on the CBC (Canadian National Broadcast) and other Canadian and Bulgarian Radio stations. Anger and Hope has recently been nominated for the Just Plain Folks Music Award for 2017. Terziev lives in Kamloops, British Columbia and teaches at his private studio. "Master of stirring mystery of sound ... His playing constantly moved between poetry and passion." "He is a musician of deeply reasoned convictions, who already has a well-defined understanding of his own artistic voice. He is a musician who thinks at the piano and who has the gift of communicating his artistic vision in an engaging manner."